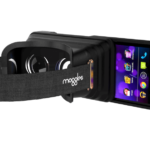 The era of portable, pocketable virtual reality is off to a good start in 2016 thanks to powerful smartphones today. 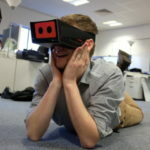 Notable players in this VR field is Google, which dramatically changed the landscape of mobile virtual reality with the cheap yet bang-for-the-buck Cardboard headset. However, it has its own hardware limitations, and many companies are inventing ways to make better mobile VR experiences with hardware. 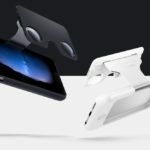 Speck, a well-known mobile device case manufacturer, has something up its sleeve for smartphone users who like to experience mobile VR while protecting their expensive investment. 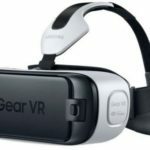 At the recently concluded Consumer Electronics Show (CES) 2016, the smartphone case-maker debuted its Pocket VR viewer – a case designed for the iPhone 6, iPhone 6s, and the Samsung Galaxy S6 that unfolds into a virtual reality headset, giving consumers a quick and easy VR experience with a compact and collapsible design. Not only will users be able to enjoy VR experiences from the convenience of their smartphone, they’ll receive the added benefit of Speck’s military-grade protective CandyShell Grip smartphone case, which is included with the viewer. Additionally, Speck is announcing their partnership with the world leader in cinematic VR, Jaunt, with whom they have created a custom viewing experience specifically for CES. Pocket VR is a Google Cardboard-certified viewer created by the award-winning Speck design team. When opened, Pocket VR and its precision-crafted lenses provide a rich viewing experience for 3D content, virtual reality, and augmented reality. When closed, retractable side panels fold into a perfectly flat, self-contained package that shields lenses from dust and scratches, and slides easily into a pocket or purse for on-the-go accessibility. Speck’s best-selling CandyShell Grip smartphone case is the perfect companion to Pocket VR, which securely grips onto the case when in use. When not in use, the viewer can be easily stowed while CandyShell Grip will continue to provide smartphones with military-grade protection against everyday bumps and drops. Pocket VR with CandyShell Grip will be available in Spring 2016 for iPhone 6, iPhone 6s, and Galaxy S6. The VR viewer and phone case will be sold together as a bundled package for $70. Compared to the Cardboard, Speck’s offering might be priced a little steep, but for the price you get both a protective case and a VR viewer for your smartphone.